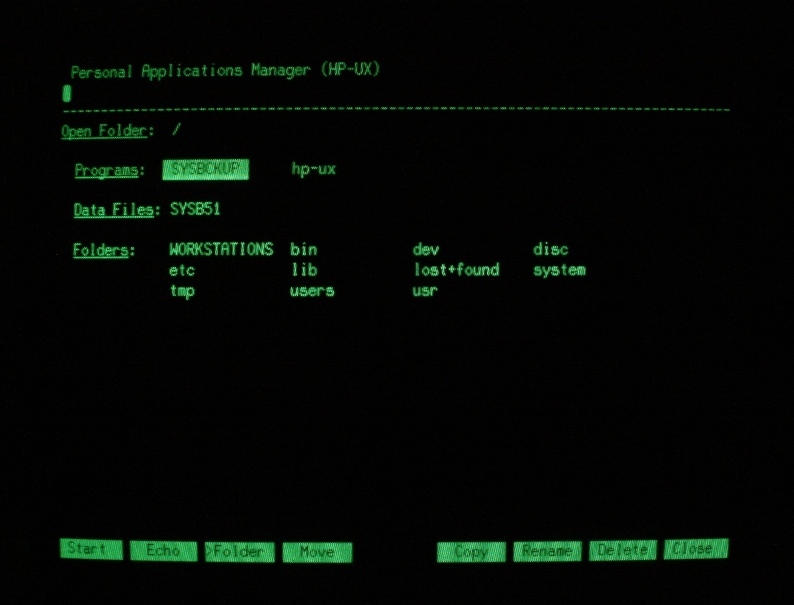 HP-UX 5.1 software for Series 200/300 computers. The zip file contains all of the original floppy discs as well as an already installed hard disc image. This is the version of HP-UX that works with the MC68010 CPU machines. We have only been able to get this software to work with a 9000/310. Our 9836U gives an error message on boot "wrong processor type". Our 9817 hangs on boot. It could be that a separate boot disc is required for Series 200 machines, and we don't have it. The hard disc image includes an installation of BASIC 5.1 as well. The downloadable hard disc image does not include the windows option. The windows option is slow and cumbersome. However, this option can be installed from scratch using the discs included in the download. The boot floppy disc is 51CORE1.TD0. After issuing the command you will be prompted about whether to continue because the actual image size differs slightly to the expected hard disc size for a 9133L. Just continue anyway. You will also be prompted to name a file to act as the floppy disc in a 9133L. Just select the default file name (or create any other). You may turn off the power to the drive and computer when the screen has informed you that the system has halted.